An excellent monthly jobs report this morning from the U.S. Department of Labor: the economy added 223,000 jobs in May, and unemployment fell to 3.8 percent. That’s the lowest rate of unemployment in the United States since 2000. The real estate industry, including rental and leasing, added three thousand jobs over last month, bringing the total to over 2.2 million, according to the Labor Dept. Lawrence Yun, the chief economist for the National Association of Realtors told Inman that housing demand will be increased by the continuing job gains, even as mortgage rates rise and the industry continues to deal with low inventory. The average hourly earnings of employees on private nonfarm payrolls rose eight cents to $26.92, according to a statement from William J. Wiatrowski, the acting commissioner of the United States Bureau of Labor Statistics. Over the past 12 months, hourly earnings have jumped 2.7 percent. 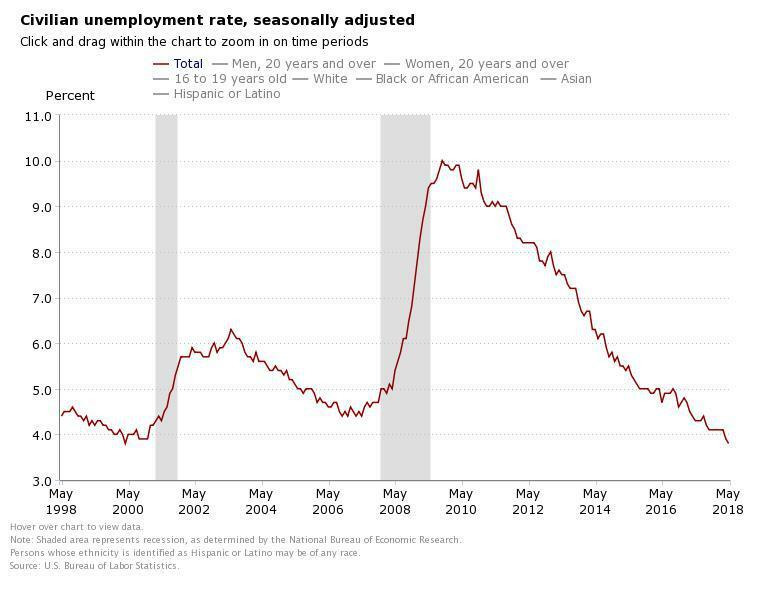 The unemployment rate fell for adult men, Blacks and Asians but changed little month-over-month for adult women, teenagers, Whites and Hispanics. President Donald Trump broke tradition, tweeting about the upcoming report more than an hour before its official release. Jason Furman, the former chairman of President Barack Obama’s Council on Economic Advisors, said on Twitter that Trump should have gotten the numbers yesterday from his council. “And if this tweet is conveying inside information about a particularly good jobs number you should never get them in advance from the Council of Economic Advisers again,” he added.